To help facilitate your recovery, we work to restore normal movements and allow you to move pain free. By recognising some of the common threads of how individuals injure themselves, we can start to incorporate our injury prevention efforts into your normal daily activities, in a pain free way. 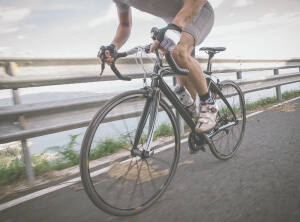 The following are the two foundations that we use to reduce the risk of injury. PHYSICAL CONDITIONING – Prepares the athlete’s body for sport and enhances performance. This includes warm up, cool down, flexibility, strength, endurance and power. INJURIES – Identify, assess and report injuries early. This helps reduce the risk of injuries so that athletes’ performance can be maintained and improved. 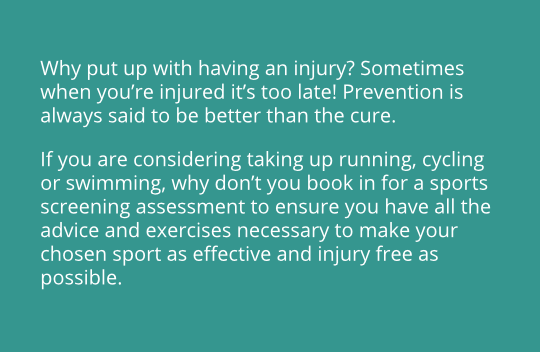 If you have been injured before then you are much more likely to get hurt than an athlete who has been injury free. Regular exercises have a way of uncovering the weak areas of the body. There are detectable and correctable differences of muscle strength and length that are fundamental to the development of almost all musculoskeletal pain and dysfunction. Detection of these differences, and correction before injury has occurred, should be part of any injury prevention programme. Appropriate exercise will not only help prevent injuries but strengthen the relevant muscles for the activities you want to do. Many injuries are caused by weak muscles which simply are not ready to handle the specific demands of your sport; screening for muscle imbalances is the current cutting edge of injury prevention. Here at The Partnership we work in both these areas, to restore you to normal quality movements for any activities you want to do.